It’s crunch time on the road to London. Two women approach the finish line of the 2012 U.S. Olympic Marathon Trials. They will make the team. A small pack is contending for the third and last spot. Who will have the guts to prevail over that painful final mile? If Stephanie Rothstein is among them, put your money on her. Her mind and her heart will push her body forward. Former UCSB track star Stephanie Rothstein heads to the U.S. Olympic Marathon trials. The Olympic Marathon Trials will take place Saturday, January 14, in Houston. There are almost 200 entries in the women’s race, and Rothstein is the sixth-fastest qualifier. 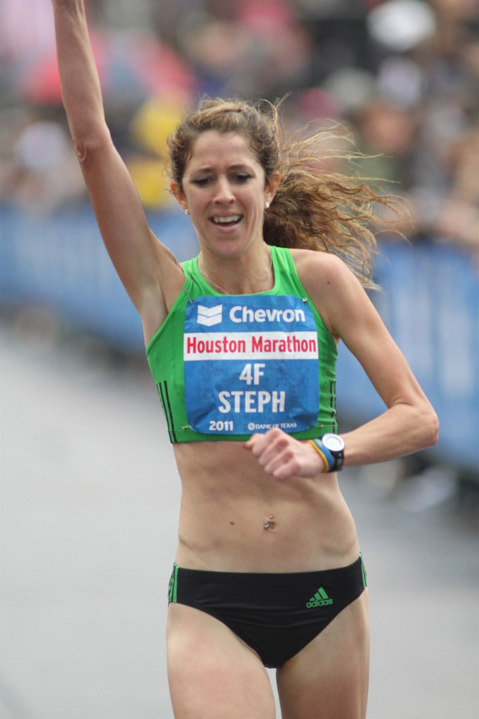 She ran the 2011 Chevron Houston Marathon in two hours, 29 minutes, and 35 seconds almost a year ago. During much of her running career, Rothstein’s health was compromised. She suffered from iron deficiency, and the underlying cause was unknown. “I felt hungover all the time,” she recalled. “I had headaches and nausea. I was irritable.” In spite of all that, she broke long-distance records at UCSB and won several Big West championships. After graduating in 2007, she moved to the running hotbed of Eugene, Oregon, and qualified for the 2008 Olympic Track & Field Trials, finishing 12th in the women’s 10,000 meters. It was not until 2009 that, through a series of experimental diets, Rothstein found out that she has celiac disease, a condition brought on by gluten intolerance. “It changed my life,” she said. “I took out gluten and dairy products, and I immediately felt better. It was bittersweet at the same time. I’ll never eat croissants and pizza again.” The revelation awoke the entrepreneur in Rothstein. With fellow runner Lauren Fleshman, she cofounded Picky Bars, a gluten-free energy snack. Rothstein’s 28th birthday is January 14 — yes, the day she will try to qualify for London. She can’t help but consider that a good omen. She has had fortune slap her and smile on her. Her father, James Rothstein, died of cancer when she was a senior in high school. He had encouraged her in athletics and told her, “You’re going to break five minutes in the mile.” She did so at the Arizona state championships a few months after his death. A downturn in her father’s business during his illness had left Stephanie’s mother, Joan Rothstein, with meager financial resources. When Stephanie was on the verge of dropping out of UCSB because she couldn’t afford out-of-state tuition, an anonymous donor stepped forward and paid for the rest of her college education. REUNIONS: Rothstein says she will attend a reunion of the 2006 women’s cross-country team at UCSB on January 21. The Gauchos finished ninth in the NCAA team championships. “Stephanie was their leader,” Dolan said. … Another UCSB reunion on January 27-28 will bring back a number of baseball players, including a pair of former Gaucho infielders who were on opposing sides in the 2011 World Series — Skip Schumaker of the St. Louis Cardinals and Michael Young of the Texas Rangers. There will be a dinner at Earl Warren Showgrounds and a golf tournament at the Glen Annie Golf Club to raise funds for both the UCSB and Santa Barbara Foresters baseball teams.